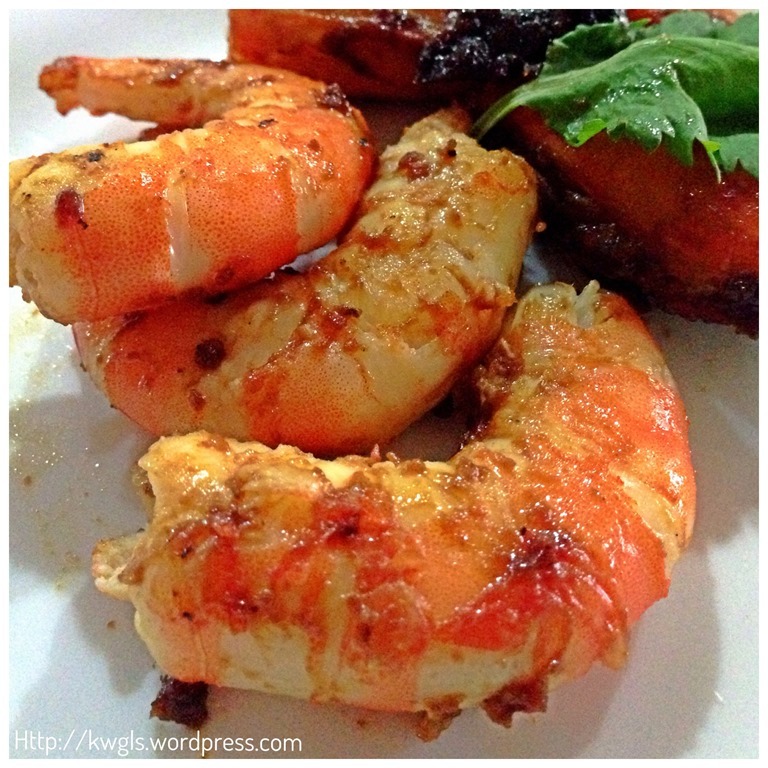 This is a long awaited post on prawns and some of the picture were a few months ago. 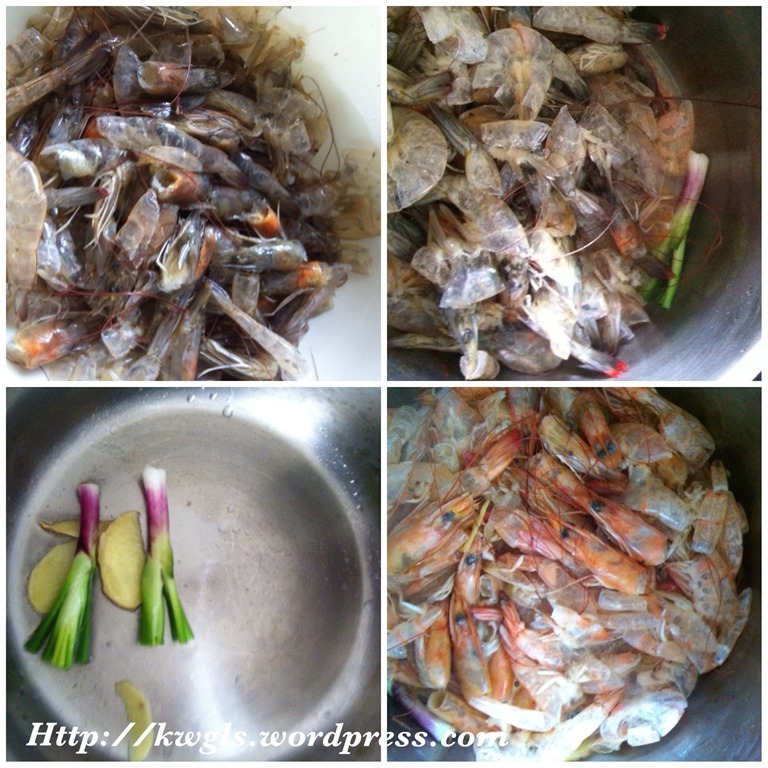 This is a special post on Chinese ways of preparing prawns for cooking purposes and including one tamarind prawn recipe. 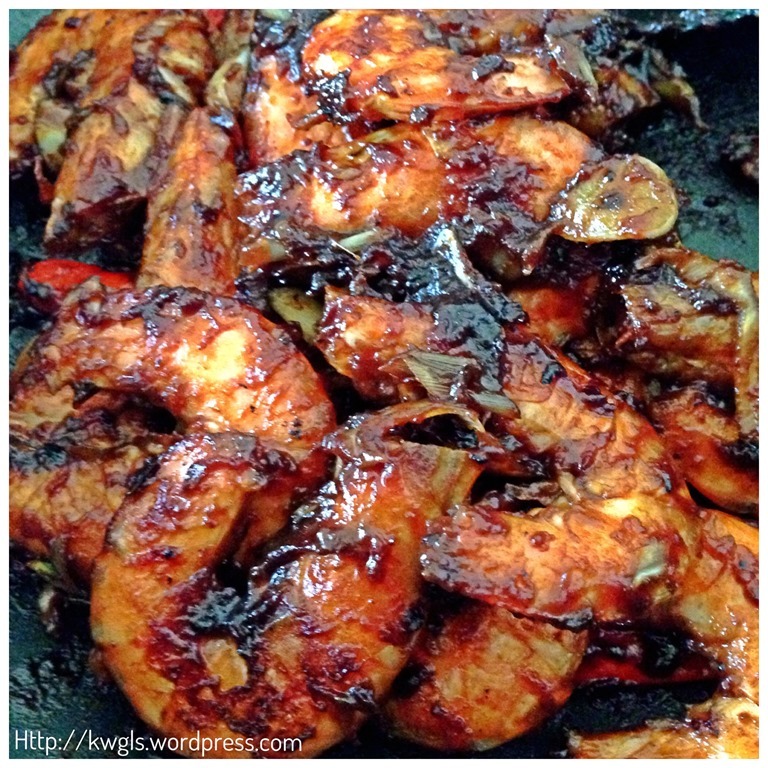 Prawns are one of the major ingredients in Malaysian and Singaporean Chinese cooking. 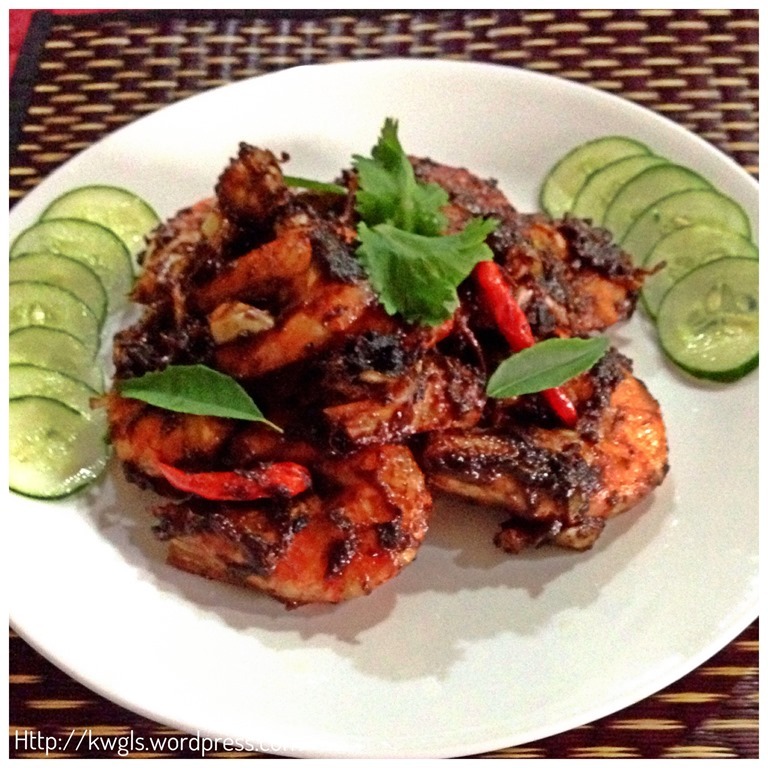 Due to the countries’ proximity to the sea, seafood is plentiful abundant and prawns are used in many cuisines. 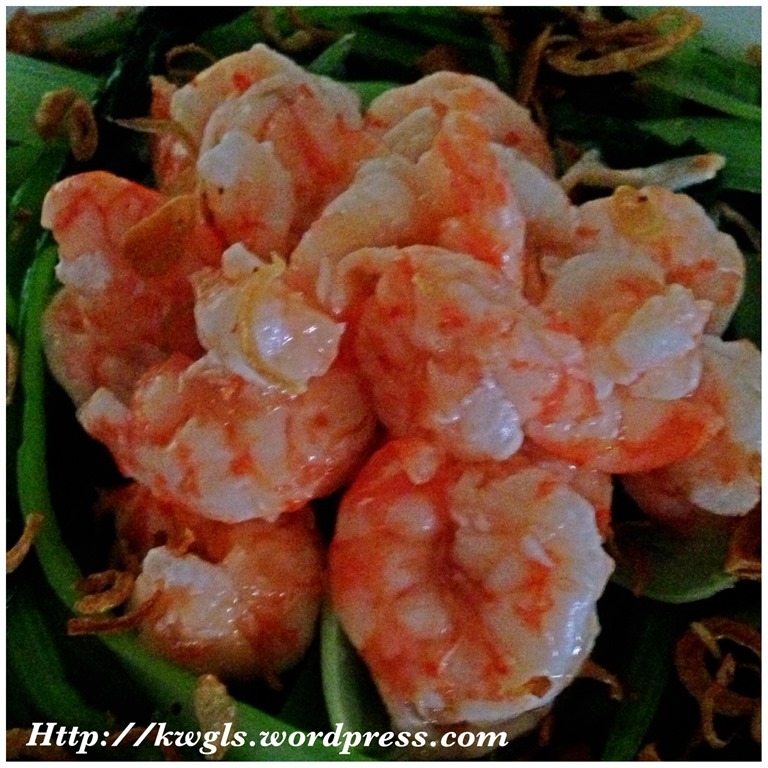 We used prawns in vegetable dishes, noodle dish, salad or a dish on its own. 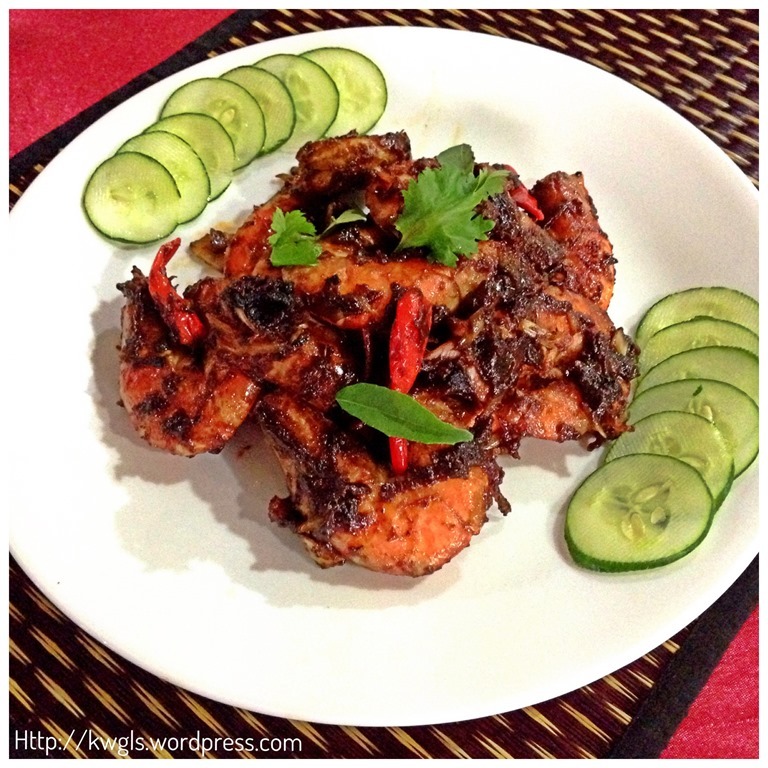 It can be pan fried, deep fried and baked, stir fried, steamed, blanch, poached or boiled. Use a kitchen scissor to cut off the head or use your hand by snapping the head and pulling the head downward. Use the hand that had pulled away the head earlier, starting from the bottom near the leg area, use your finger to pluck upwards and detach the shell from the body of the prawns. If you want to keep the tail, you can leave the last segment of the shell unpluck. 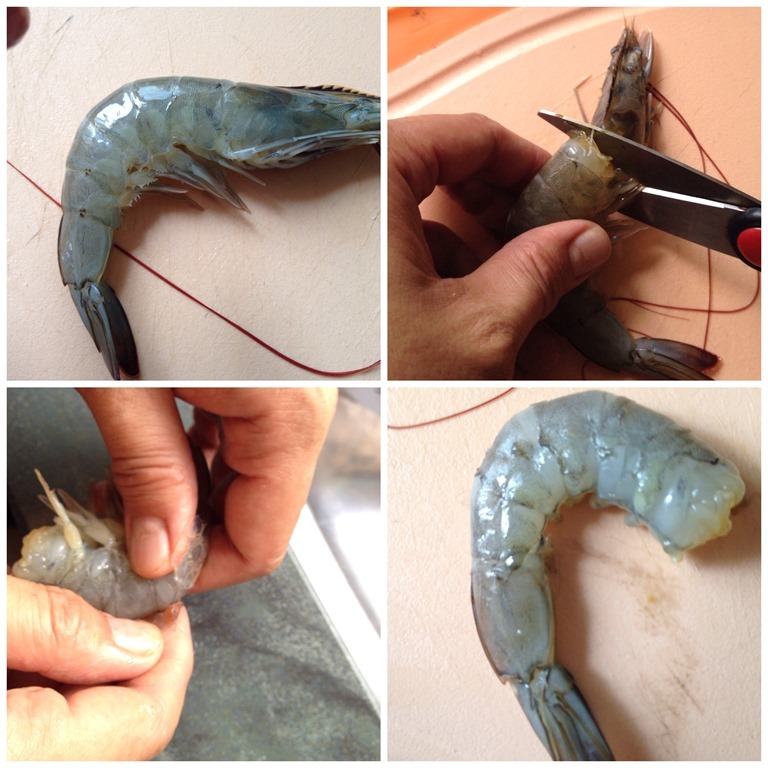 If you do not want to keep the tail, use your hand to squeeze the prawns near the tail area and pull it out. 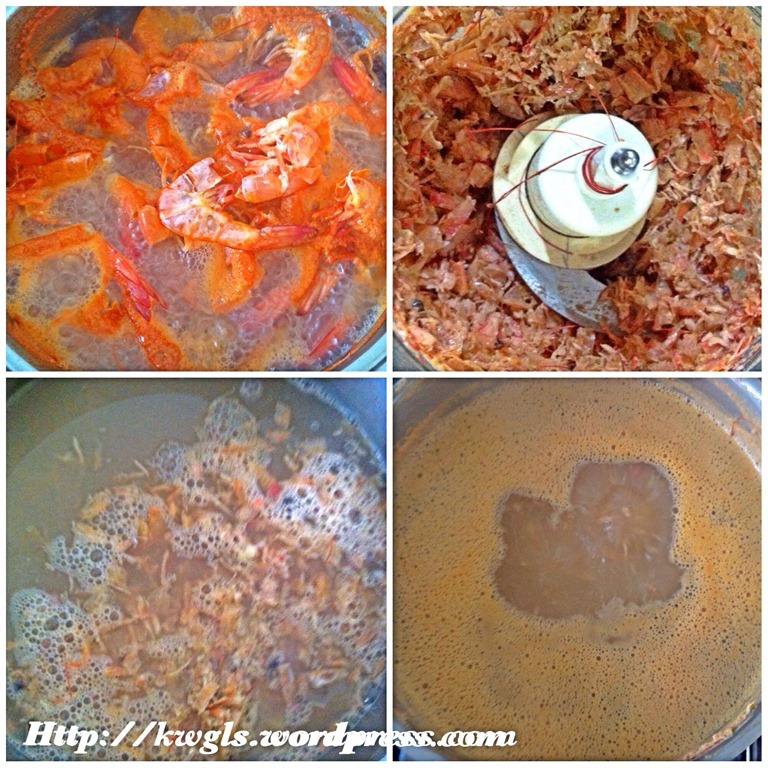 Keep both the tails and heads of the prawn if you want to prepare prawn broth for other noodle cuisines. 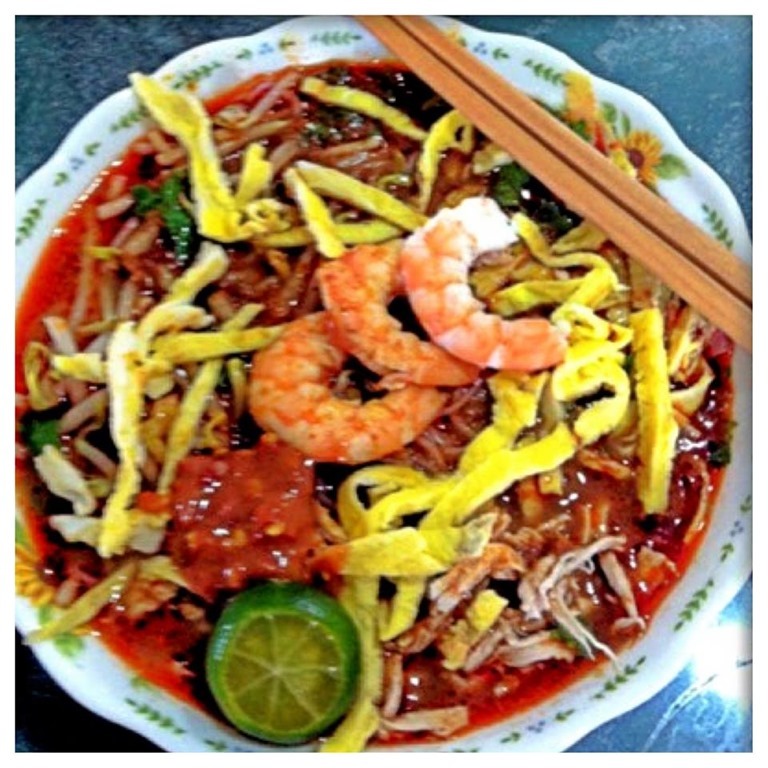 Fully de-shelled prawns is good for cuisines such as prawn fritters or cooking noodles dish such as Sarawak Laksa, Hokkien Prawn Noodles. As the head and tail of a prawn is rather sharp, if I am cooking the cuisine with shelled prawns, I will use the following method. Use a kitchen scissor to cut the sharp part of the head and its tentacles. Use the scissor to cut away the legs and follow by the sharp part of the tail. This is good for cuisine that requires shelled prawns so as to prevent the prawns from overcook. 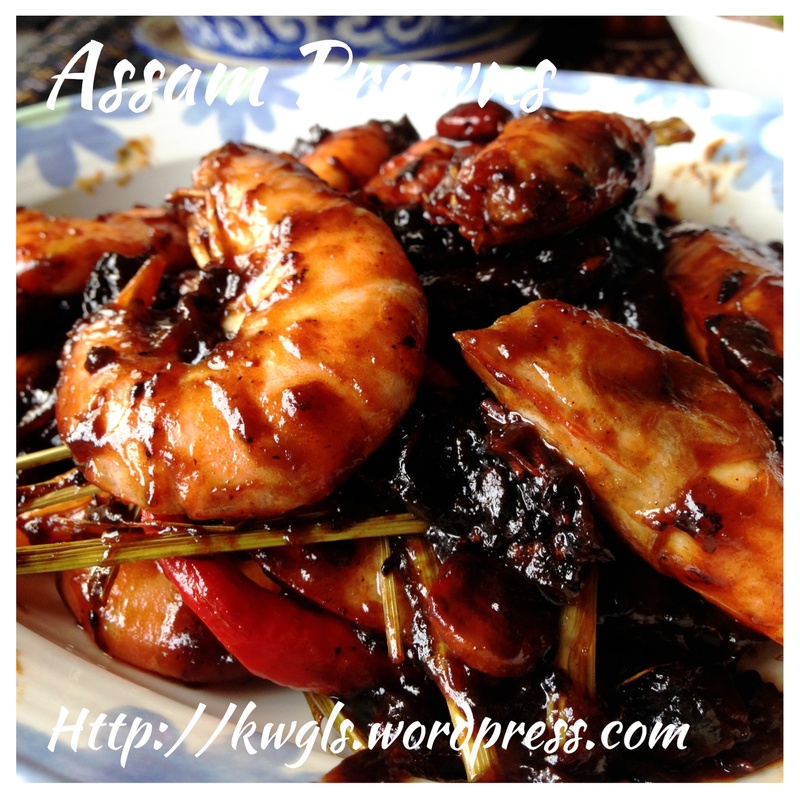 Example of cuisines are tamarind prawns or steamed prawns. It is unsightly if the delicious cooked prawns have black intestines in its white flesh. Therefore, deveining the prawns is deemed necessary for bigger prawns. At times, the prawns are rather clean and no deveining is necessary. 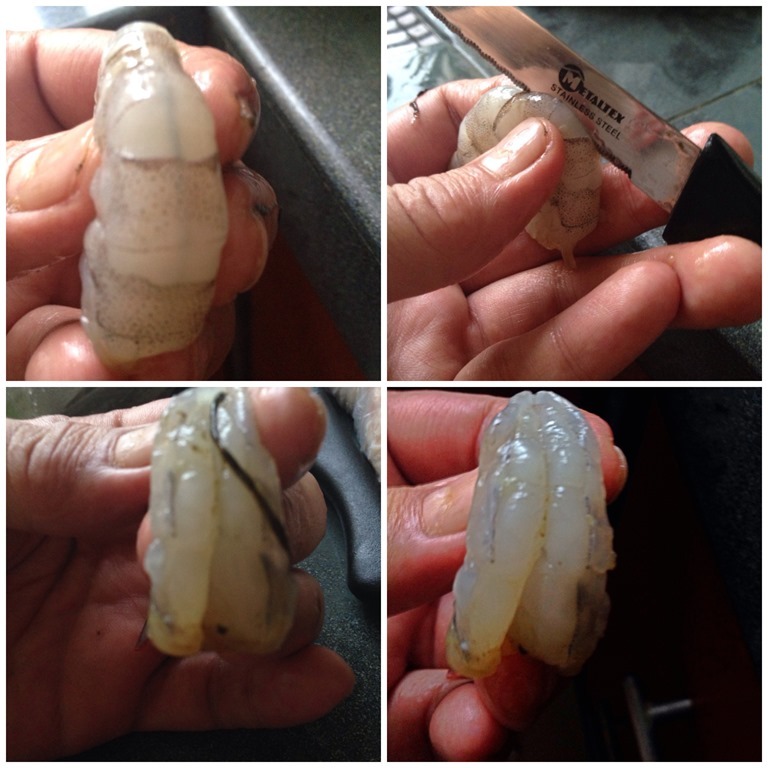 Use a small knife to cut along the top part following the shape of the prawns, Use your hand to pull away the intestines. This is also a step to shape the prawns when cooked. If you cut it further inside, the “flower” shape of the cooked prawns will be more obvious. For the lower intestine, use a toothpick to pierce through the intestine near the end of the tail. 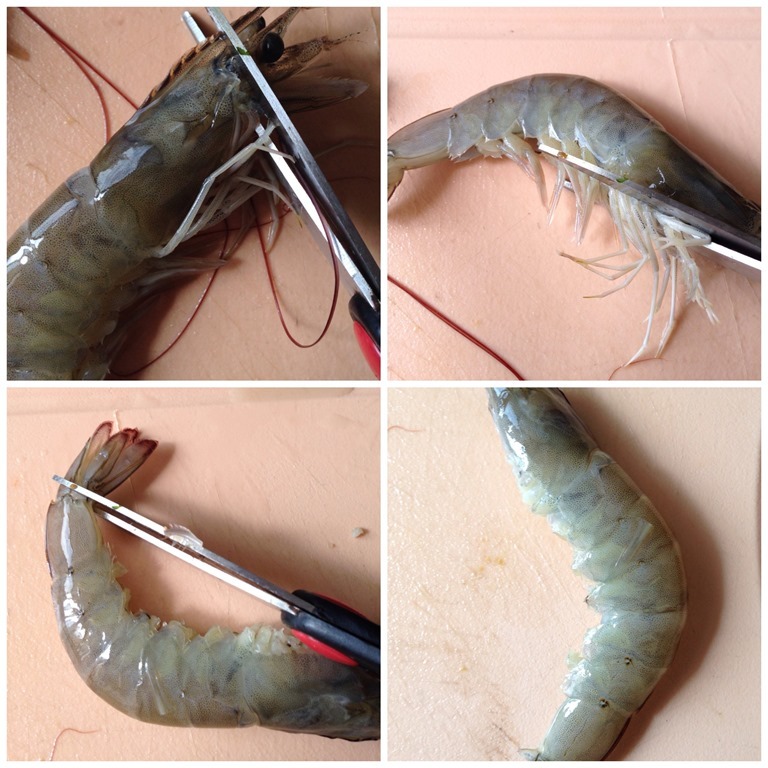 Use the same toothpick to pierce under the intestine in the middle of the prawn. 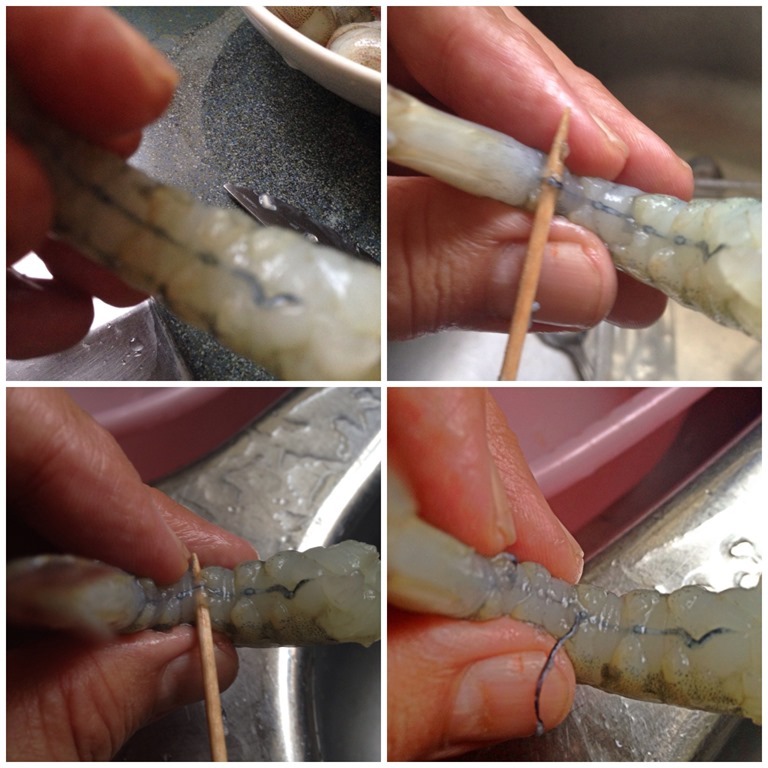 Take the toothpick out by cutting open the prawn fresh above the intestine. When you take the toothpick out, the intestine near the tail will follow the toothpick and comes out. Use your hand to pull away the intestine. Note that you have to be slightly careful when performing the steps so as to avoid breaking the intestines. This is how I usually freeze my prawns to avoid damaging to the meats of the prawns in the event I do not have the time to properly defrost the prawns. Wash your de-shelled prawns with clean water. Divide the prawns for individual serving and put it in the plastic bag. Add a small amount of water to the plastic bags and and keep it in the freezer. To defrost, just take out the prawns and let it defrost at room temperature. 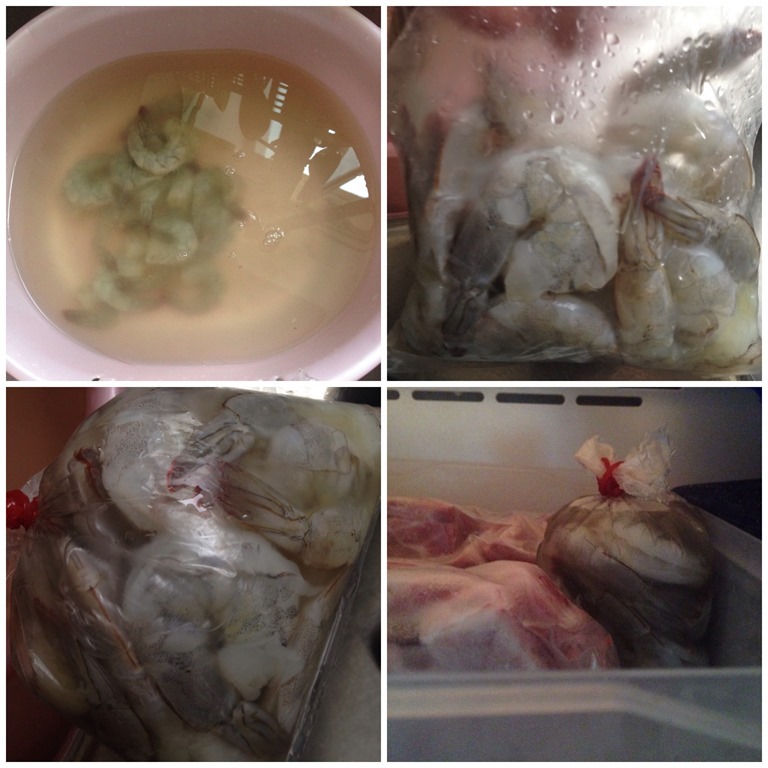 If you do not have adequate time, cut open the plastic bag, put it under running water and the prawns can be separated easily when the ice melts. Prawn shells and prawn heads can be “recycled” to make prawn broths which can then be used for the making of many noodles dishes. it is also a good source of iron and calcium. Wash the prawn shells and prawn heads and set aside. In a big pot of water, add some spring onion and ginger slices (optional), prawn shells, prawn heads and bring to boil under high heat. Once boiled, drain and transfer to a food processor. Keep the broth. Blend until fine, transfer it back to the broth and let it simmer for another 15-20 minutes. Drain again, cool and keep the broth in the fridge for uses such as Hokkien Prawn Noodles, Penang Prawn Noodles, Sarawak Laksa broth and etc. You can keep in the fridge for quite a number of few weeks. Color of the broth will very much depends on the types of prawns that you bought. If it is female prawns with lots of eggs, it will be orangey in colour. This is a Peranakan dish (Nonya dish). 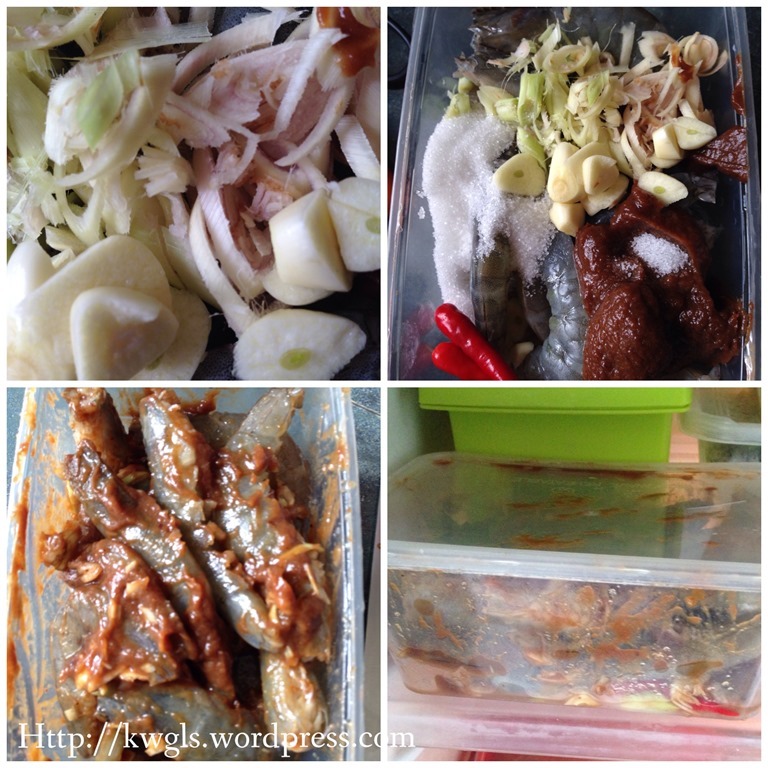 I am not Peranakan, however, my mum used to cook this when we are young. I have not eaten this prawn dish for quite a while and I am happy that I managed to replicate the dish without much difference in the flavour. 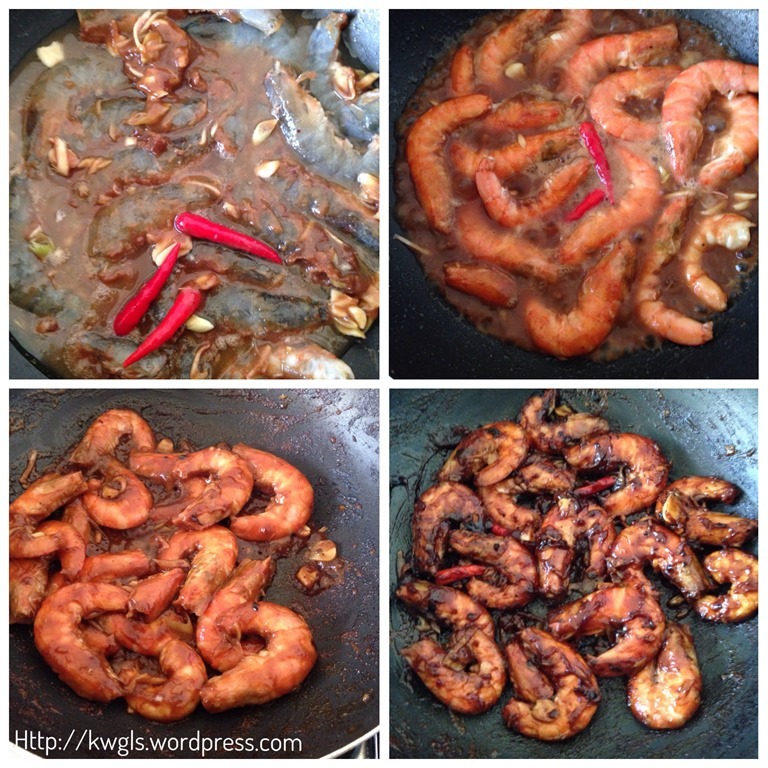 The cooked prawns should be coated with slightly burnt and/or caramelized tamarind. It should looked dark and taste should be sour with tinges of sweetness. Tamarind is also called Assam in the Malay Language. Put all ingredients together, stir well, ensure that all the prawns are coated with herbs and pastes. 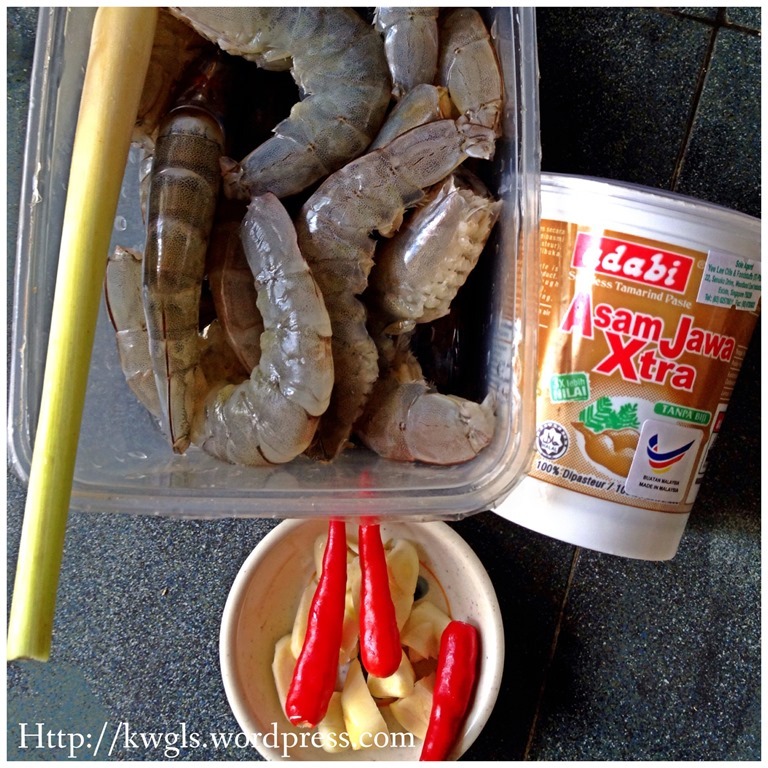 Marinate the prawns for 2-3 hours in the fridge. In a big frying pan, heat the oil using high heat. Add the marinated prawns together with the sauces and the herbs. Stir fry for one minute. Add half cup of water and bring to boil. Once boil, turn to medium heat and continue to cook until the water dries up. You will witness the colour for your prawns start to get darker and glossier as the water evaporates. 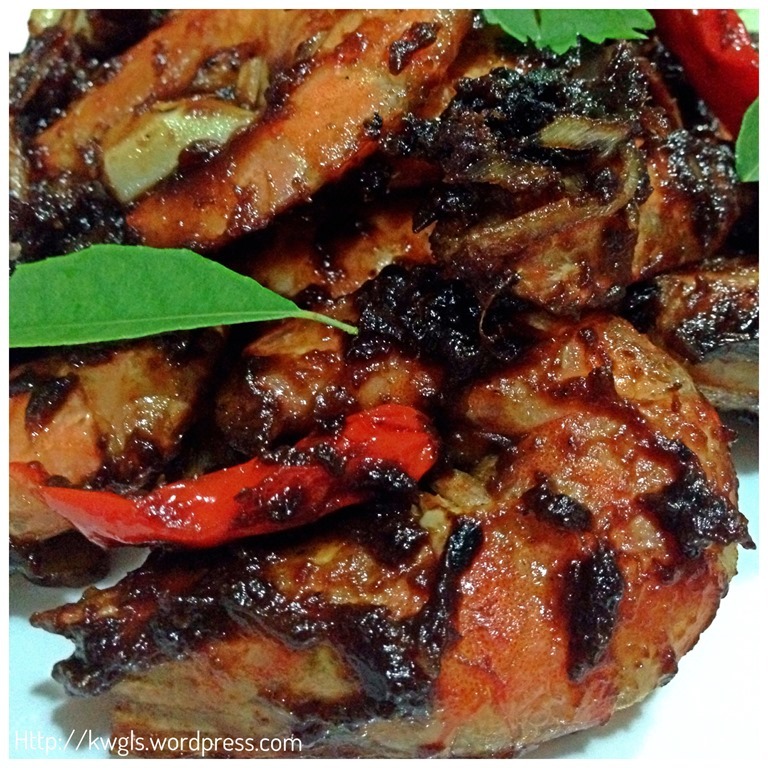 It is okay if there is a slight burnt in the shells of the prawns. Scoop out the cooked prawns and all the remaining sauces. Garnish with some greens such as coriander leaves if prefer. Best serve hot with white rice. 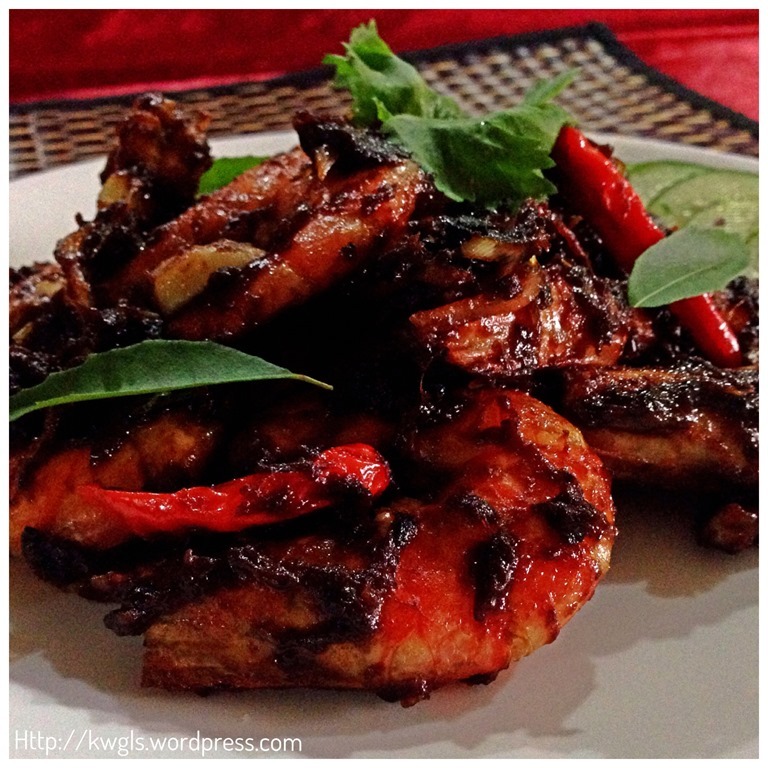 The first part of the post is to share with readers how I prepare my prawns for cooking and the second part of the post is a recipe of tamarind prawns. Hope you like the post together. Cheers and have a nice day. 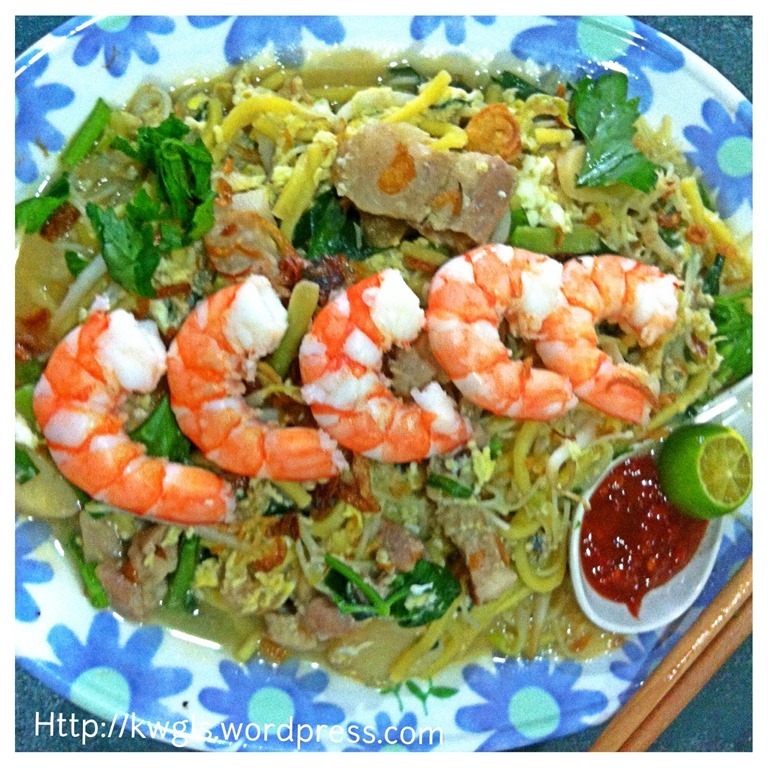 This entry was posted in Dish, Food Preparation Series, Interesting Cooking Ingredients Series and tagged assam, assam prawns, hokkien mee, postaday, Prawn, Prawns, Sarawak laksa, tamarind, tamarind prawns. Bookmark the permalink. Thanks for sharing this post-very useful. We eat a lot of prawns in this house! Fabulous range of dishes too! Wonderful tutorial and gorgeous photos. Prawns are my favorite dish but living in the Midwest our seafood selections are so so. However, I am definitely going to give the Tamarind recipe a try it sounds fabulous! Thank you for sharing on the Four Seasons Blog Hop.